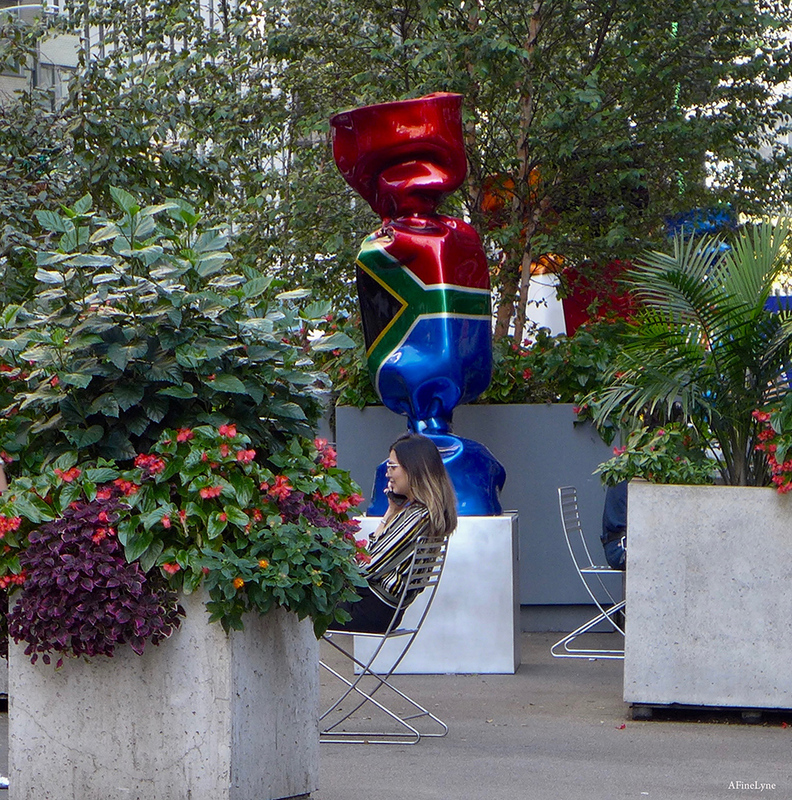 Created by prominent French sculptor Laurence Jenkel, each unique polyester resin sculpture in the Candy Nations series weighs 1,450 pounds, and represents a piece of candy wrapped in the national colors of one of twenty countries ~ along with the artists optimistic message of unity that lies beneath our external differences. Signage affixed to the base of the sculptures provides information about each featured nation. Candy Nations was originally created for display at the G20 Summit in Cannes, France in 2011. 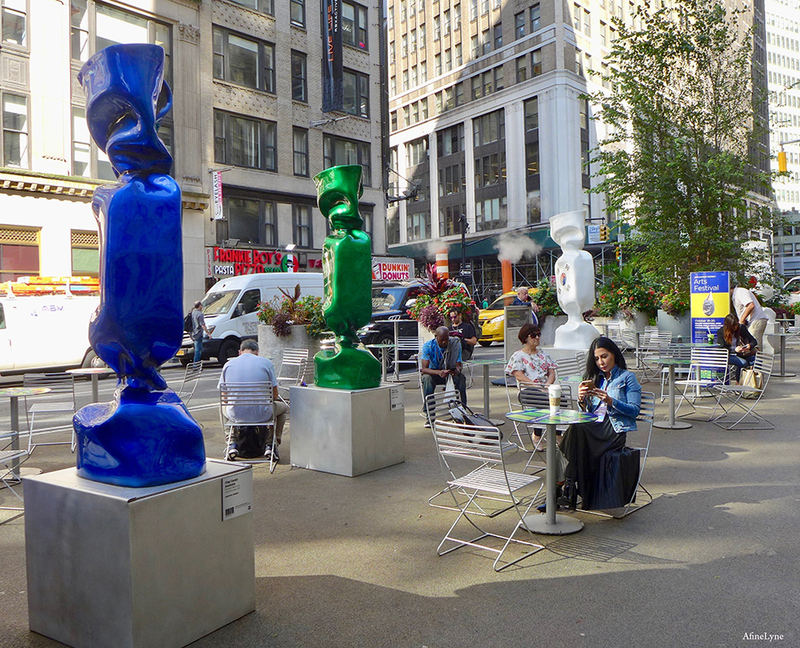 The installation on Broadway will include sculptures representing Japan, Mexico, USA, Australia, Brazil, Canada, South Korea, Argentina, South Africa, European Union, Germany, France, Great Britain, India, Italy, Indonesia, China, Russia, Turkey and Saudi Arabia, and will complement a wide range of public programming created by the Garment District Alliance throughout the year, including the Garment District Alliance’s 15th Annual Arts Festival and the Garment District Alliance Space for Public Art Program which includes three artists featuring canvas and fabric in three separate locations. 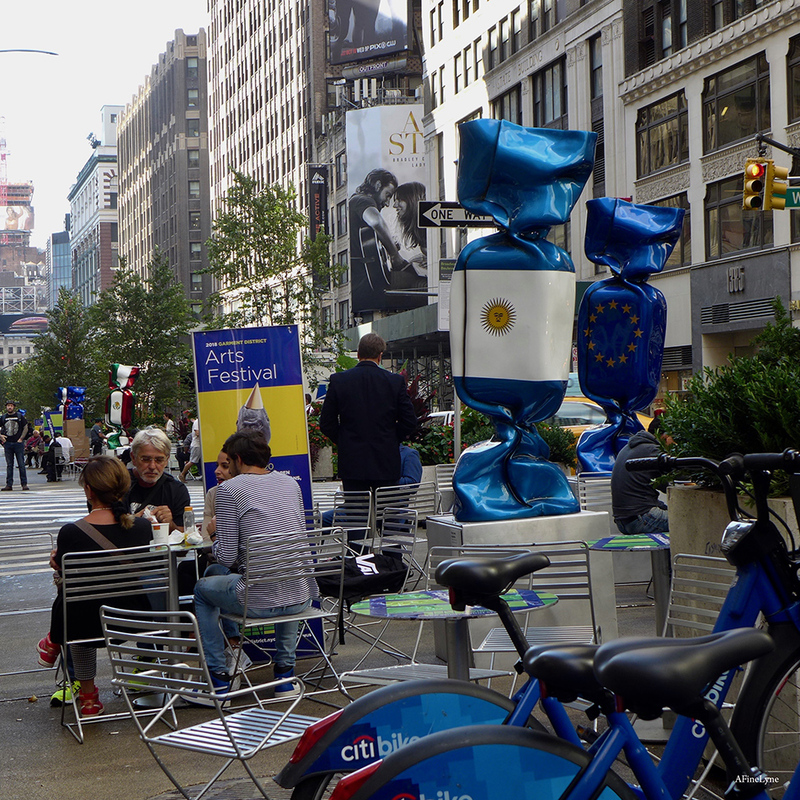 Candy Nations will be on view October 3 to December 9, 2018, and is a free installation made possible through Arterventions, a subpart of the New York City Department of Transportation’s (DOT) Art Program, and The Garment District Alliance. 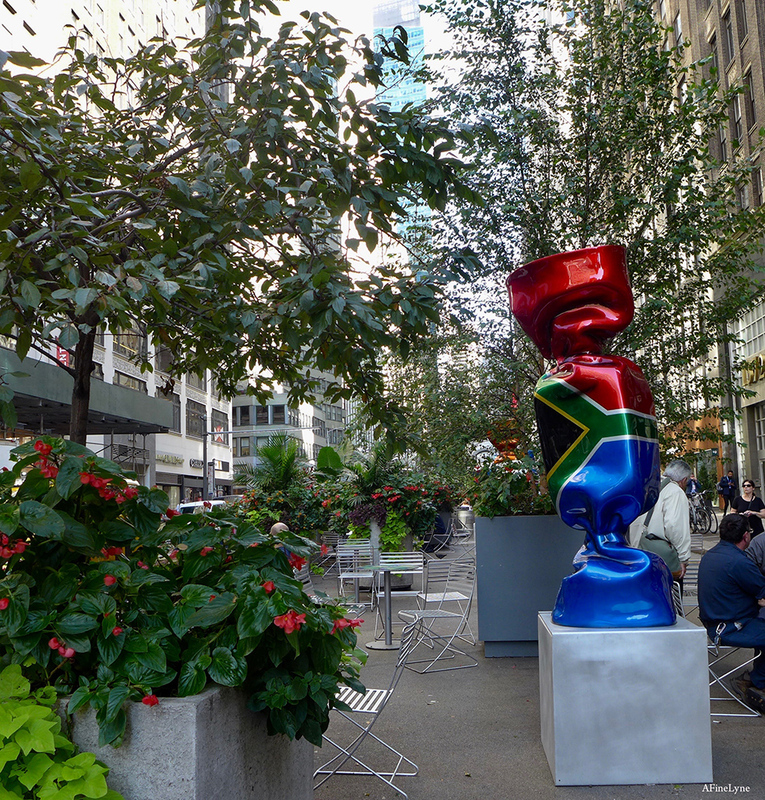 Beginning the 1st of the year (2019) you can find Laurence Jenkell’s Candy Nation at the World Trade Center Campus, Observatory/West Plaza, Liberty Park, Oculus Plaza, the West Concourse until the end of February, 2019. 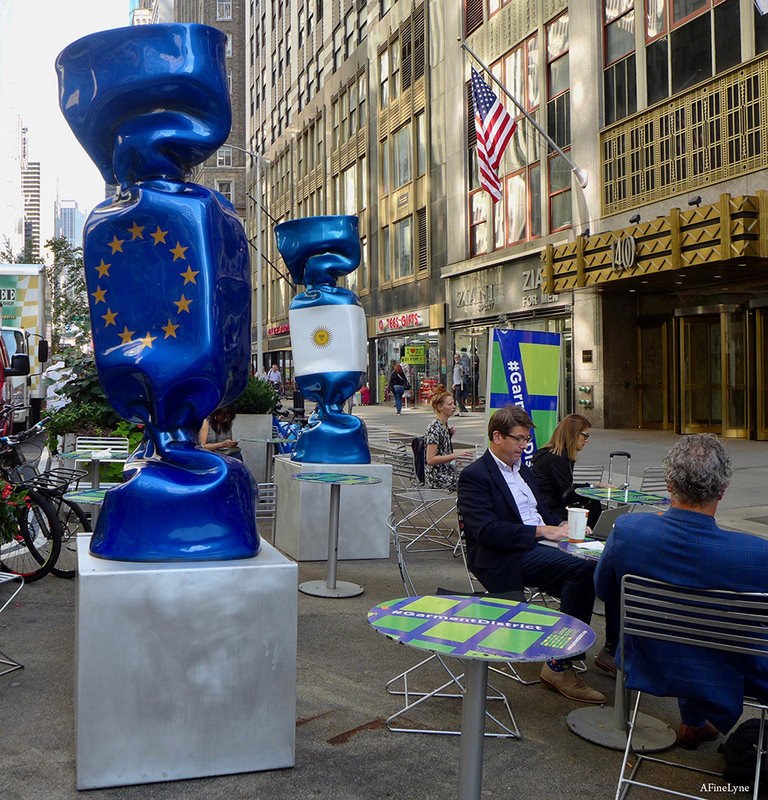 We would be remiss if we didn’t also include an article written by Davis Richardson for the Observer about the sculpture celebrating Saudi Arabia’s place in the G20 Summit, now on the grounds of the World Trade Center (January 2019). 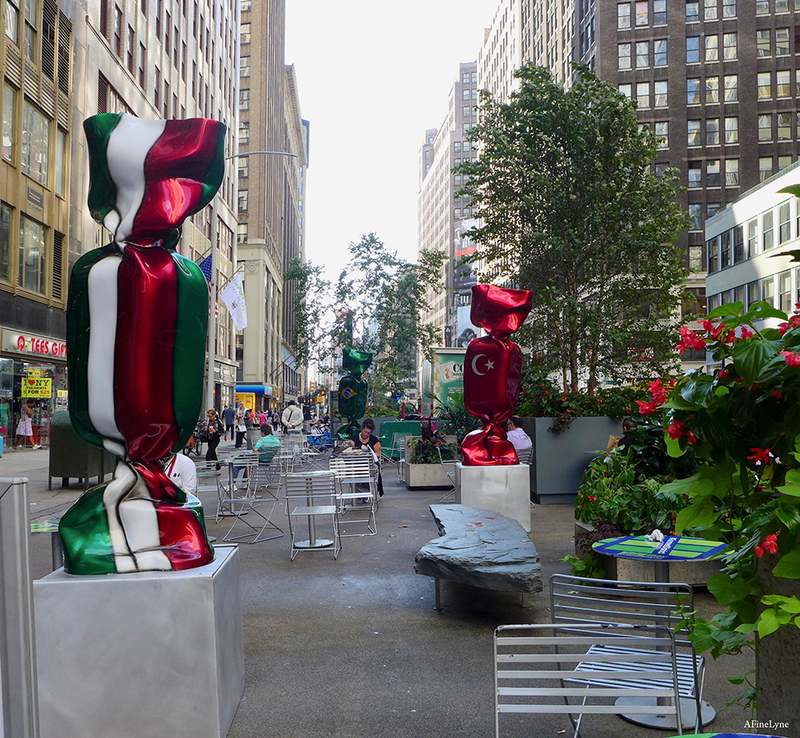 As we walked in and around each of the Candy Nations Flag Sculptures, we couldn’t help but notice the New Yorkers, themselves a plethora of ethnicities, sitting among the new works ~ each totally engaged the way New Yorkers are, in their daily morning routine, completely unaware that the unveiling of Candy Nations was taking place on the Garment District Mall. So let’s take a walk. 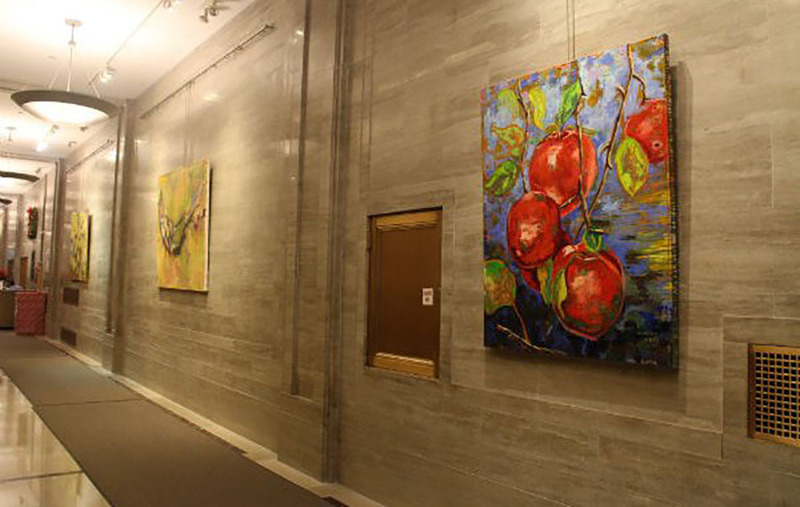 First up ~ Margaret Zox Brown who offers a series of nine expressionist oil paintings titled Color and Life at the Kaufman Arcade building, 132 West 36th Street. 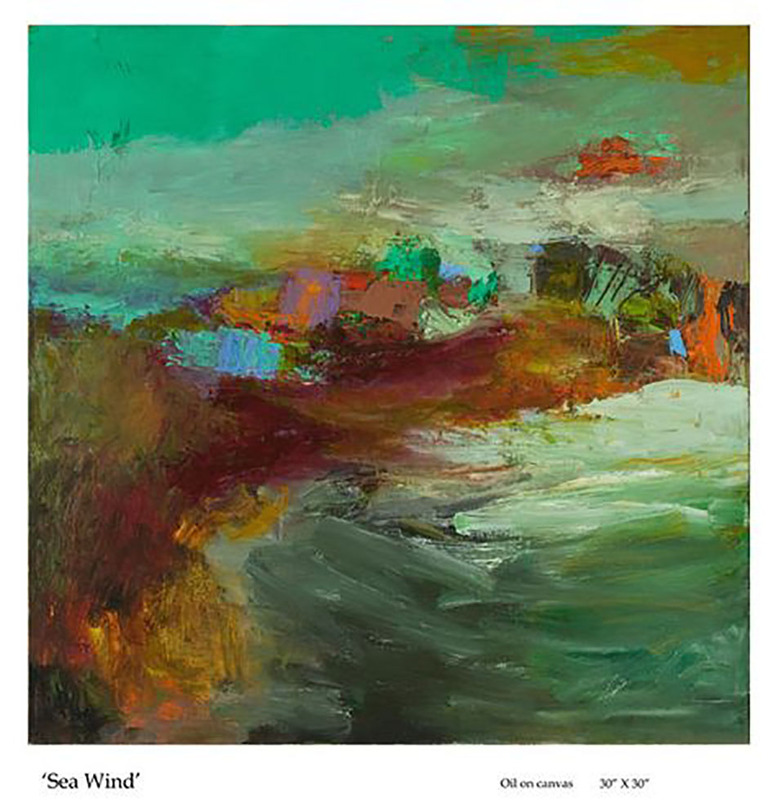 Brown works from a studio in the Garment District and studied with the prominent oil painter Brian Rutenberg. Her exhibit runs through November 2nd. Japanese-born Kohrou Kawata, one of the world’s leading dye artists, is presenting SŌME, a display at the Garment District Space for Public Art at 215 West 38th Street. SŌME, the Japanese word for dye, is being shown in conjunction with a full exhibit of the artist’s work at the Medialia Gallery until October 27th. 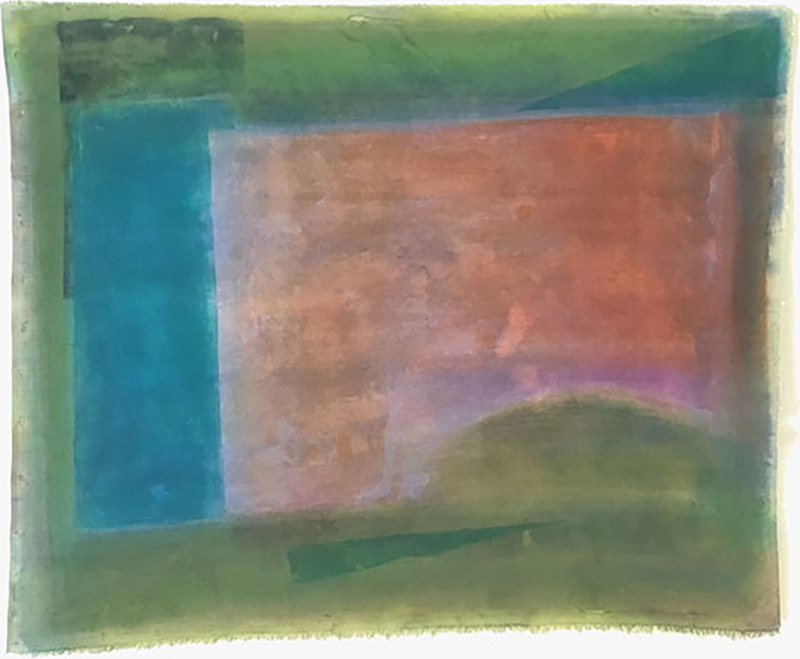 Arleen Joseph presents a series of “ethereal,” abstract oil landscapes names Journeys at the Staybridge Hotel at 340 West 40th Street, between Eighth and Ninth Avenues. Her exhibit ends on November 1st. It is interesting to note that Joseph was an internationally successful dress designer for twenty-years when she turned to oil painting to continue her artistic expression. 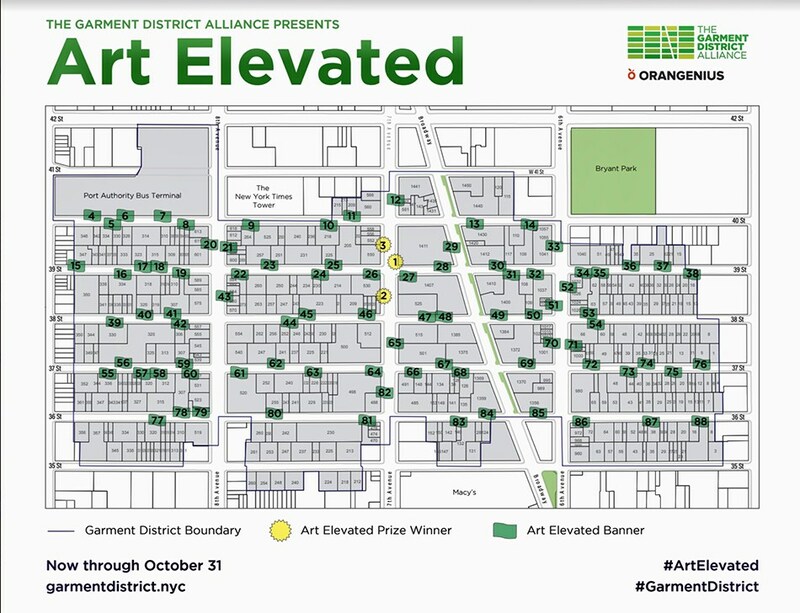 The Garment District Alliance is proud to present the 15th Annual Garment District Arts Festival, a district-wide celebration of the artists, performers, galleries and theaters that contribute to the creative energy that fuels this neighborhood. 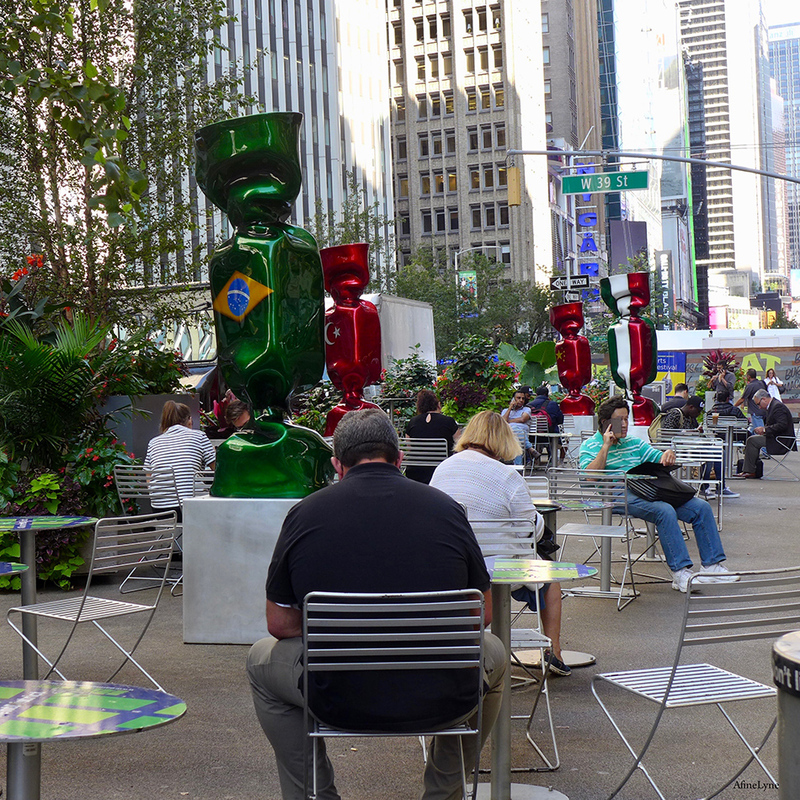 The Garment District Arts Festival takes place October 18-20. 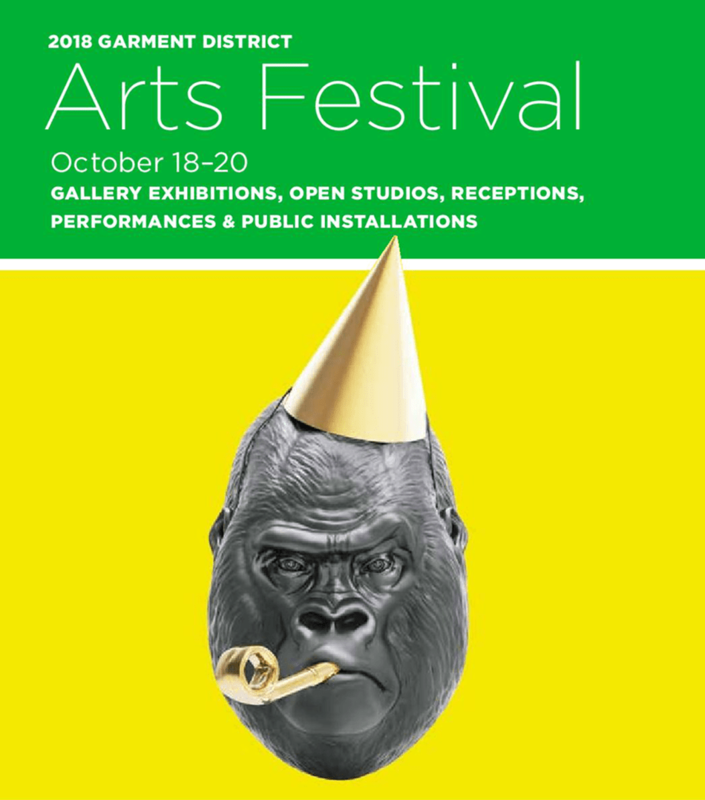 Visit the 2018 Arts Festival Website garmentdistrict.nyc/arts/arts-festival for the most up to date festival information. 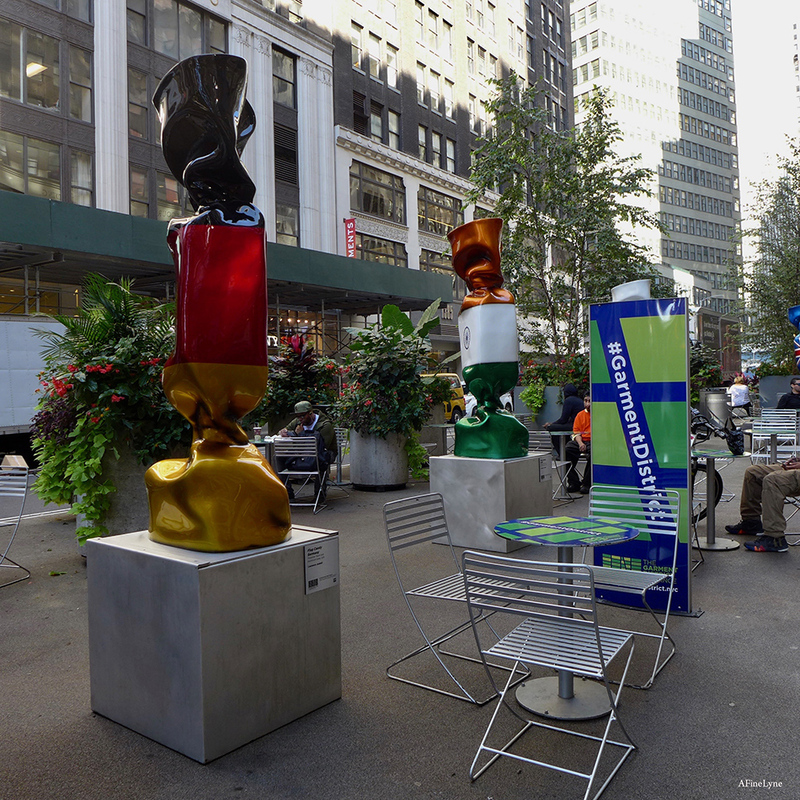 Make a behind the scenes visit to artists’ studios, view a unique installation (like our district-wide Art Elevated), enjoy the creative talents of crafters and artisans in our Makers Wayexhibit on Broadway, or tour our numerous galleries. 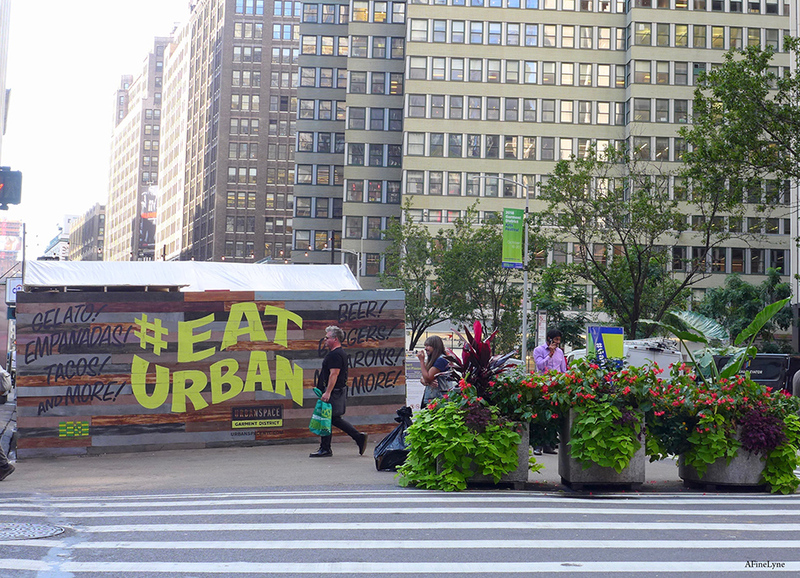 It’s all part of the 2018 Garment District Arts Festival. While you’re there, don’t forget to look up ~ at Art Elevated, on view to October 31, 2018. Art Elevated Map ~ Don’t forget to look up!